A beautiful cotton summer gown, it can also be used as a bathrobe. Yukata are casual kimono, easy to wear, light, and comfortable. The Plum Blossom Kimono is a lightweight print kimono and 100% cotton. It features a beautiful pattern of plum blossoms and birds. Japanese yukata or summer kimono are traditionally worn in the long, humid summer months and are now also often found in traditional inns, hotels and hot springs where they are worn after bathing. To wear a yukata pull the right side around your body, then pull the left side of the yukata around your body and over the right side. Wrap the matching sash-style belt around your waist and tie in a bow. You're done! 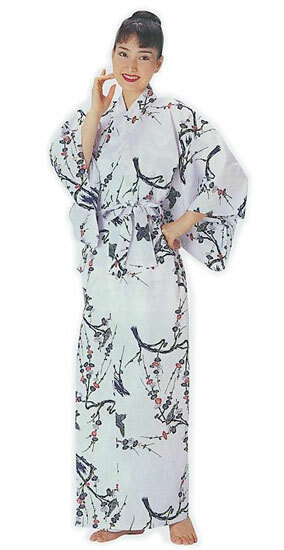 This yukata features a beautiful pattern of plum blossoms and birds.